Knit of Cascade 220 in color # 4002 (dark gray), #8010 (off-white) and #2401 (burgundy). Knit on two size US#10-1/2 circs. I knit both socks at the same time toe-up, and then grafted together at the top in the ribbing. 1) I’m not fond of knitting scarves. I should remember this next time I have a sudden urge. Remind me if I forget again, please! 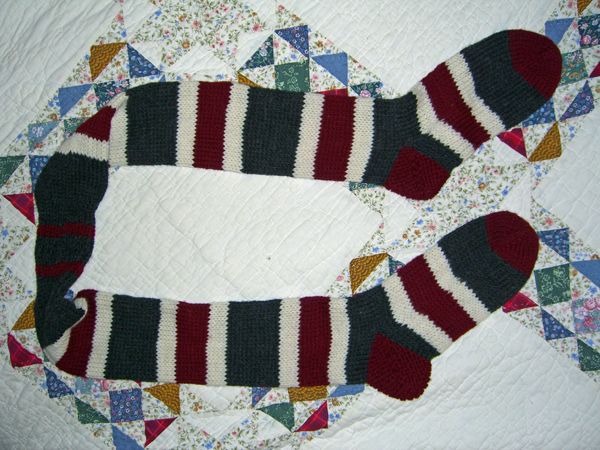 2) Knitting toe-to-toe like I did on Sock Scarf the first was more successful. I don’t like the way the grafting looks between the ribbing on Sock Scarf Two, and that’s why I didn’t make more of an effort to get a good pic of the ribbing. One row of straight knit at the top of each sock might have looked better. Or maybe a provisional cast on at the top, and then worked both socks top-down. 3) I could do a lot better at the “jogless jog.” That technique may work great for some people. My jogless jogs still jog plenty. 5) Some people have no sense of humor and do not understand why a sock scarf is a fun thing to wear. These people will never get it. They should be treated with kindness and compassion nonetheless. In totally unrelated news, #1 Son has been doing a good job of keeping in touch with his poor, worrying mom. He is having a wonderful time playing in California. We will now make small sacrifices to the weather gods that any ice that hits Portland will have come and gone by Wednesday next.